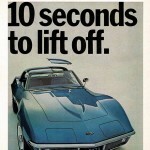 We tie up our series on vintage Corvette magazine ads with this series of 4 advertisements from the 1970s. For many in 1977 – like today – the Corvette was a dream car, what people worked and saved their entire lives for. 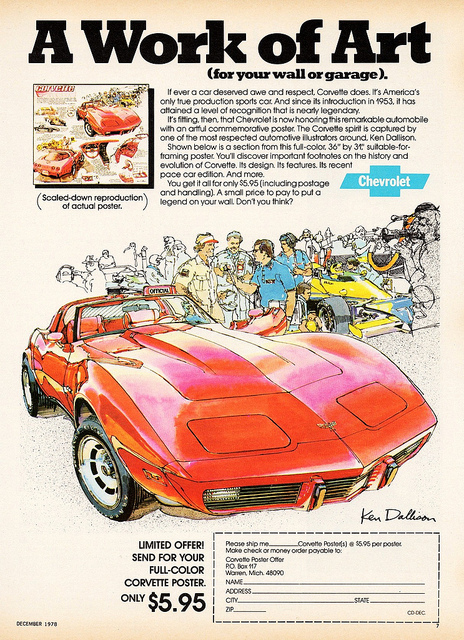 Chevrolet capitalizes on the exclusivity of owning a Corvette in this ad, featuring a yellow 1977 model being driven out of a parking lot. “Now that’s a dream that ranks with scaling tall mountains and sailing wide seas” evokes the explorer and adventurer in all of us. 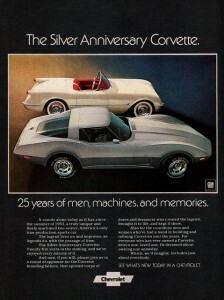 After 25 years, sales on the Corvette were still going strong, and Chevrolet prepared to celebrate it’s silver anniversary. The ad features a stunning photograph of the 25th silver anniversary edition along with the original 1953 Corvette, and the slogan “25 years of men, machines, and memories”. 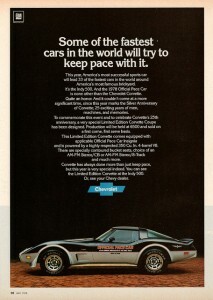 The 1978 Corvette was selected as the pace car for the Indianapolis 500, the same year as the “silver” 25th anniversary of the first American sports car. To celebrate, Chevrolet released a limited edition Coupe was produced. 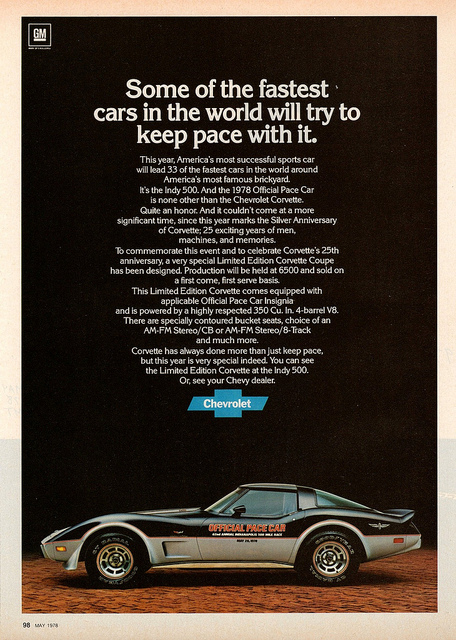 Each of the 6500 cars in this run carried the Official Pace Car graphics and a 350-cubic inch 4-barrel V8 engine. Interested? There’s one for sale here! Then everyone can try to keep pace with you! 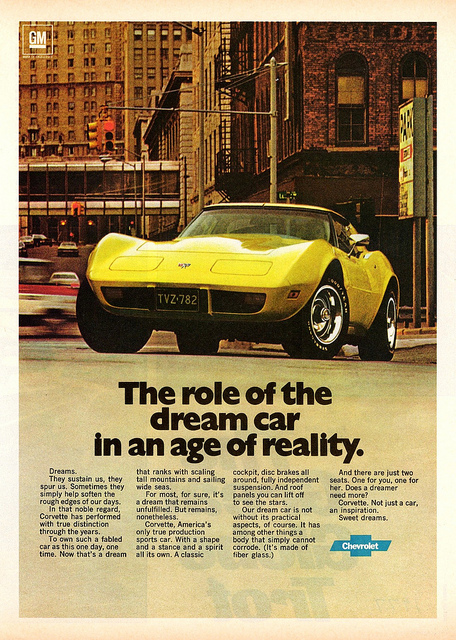 Perhaps it’s not enough to have an actual Corvette in your garage – now you can have a poster there too! Or in your office, your bedroom – this one’s for everyone. 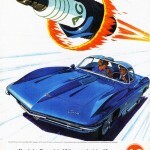 For only $5.95, Corvette fans could mail in the coupon form from this advertisement and in return receive a 36″ x 31″ poster with illustrations of America’s favorite sports car. 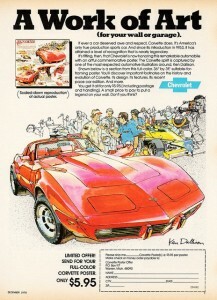 What a great way to spread the word…the 1970s version of viral marketing! The artwork for the poster was created by renowned illustrator Ken Dallison. He has a website with some of his prints for sale at www.kendallison.com. 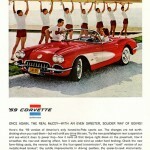 We hope you’ve enjoyed our series on Vintage Corvette Advertisements. We’ve enjoyed finding and writing about them! A final thanks to Alden Jewell on Flickr for publishing these ads.